His teachings based on universal religious Truths expand to cover concrete proposals for resolving worldwide political and economic situations, and he has given over 2,400 lectures in both Japanese and English. His lectures have been published as books, and a number of them have become bestsellers. He has published more than 1,900 books, including The Laws of the Sun, which sold a million copies. He has held numerous seminars and produced 9 films based on his teachings. In 2011, he recorded in the Guinness World Records as “the most books written in one year by an individual,” after publishing 52 books in 2010 alone. His publications continued to increase after that, and he published 161 books in 2014. Furthermore, his books have been translated into 27 languages, beginning with English, German, French, Portuguese, Chinese and Korean, and for the readers all over the world. In 1984, Ryuho Okawa was transferred to the Nagoya branch, as it was customary for potential future executives. It was around this time that the thoughts about publishing spiritual messages started to surface, and in August 1985, he published his first book,Spiritual Messages from Nichiren* (available only in Japanese), under his father’s name. * Nichiren (1222 – 1282): A Japanese Buddhist monk who founded a sect of Buddhism called Nichiren school. In 2010, he published 52 books in a single year and was given the Guinness World Record for “the most books written in one year by an individual.” Master Okawa’s books have also been translated into over 27 languages such as English, German, French, Portuguese, Chinese, Korean and others, gathering numerous readers around the world. Outline of the teachings are written in the series, Trilogy of the Laws – The Laws of the Sun, The Golden Laws and The Nine Dimensions: Unveiling the Laws of Eternity. Notably, The Laws of the Sun, the modern bible, attracts many readers from all over the world. In Japan, a new book joins the Laws series at the start of each year. Every Laws book is very important as it indicates the philosophy and the guidelines of the activities throughout that year. In the recent years, many books on spiritual messages have been published. These books contain messages from the spiritual beings or the guardian spirits of the people living in this world, and they (the messages) are summoned by Master Okawa to deliver their thoughts and ideas. Some books and sutras with profound Truths are only available at the local branches and temples and the Shojas, and only to the members of Happy Science. 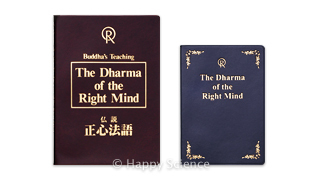 The Trilogy Represents the Core Teachings of the Buddha’s Truth. The Trilogy consists of three sacred books – The Laws of the Sun, The Golden Laws and The Nine Dimensions: Unveiling the Laws of Eternity – which describe core teachings of Master Ryuho Okawa. These books can be purchased online or at the local bookstores. The Laws of the Sun – One Source, One Planet, One People is the fundamental book of Buddha’s Truth. It reveals the real Genesis and illustrates the developmental stages of Love and the structure of enlightenment. The rise and fall of the past civilizations on earth, and the true mission of Lord El Cantare are revealed for the first time in human history. The Golden Laws – History Through the Eyes of the Eternal Buddha outlines the lives of great historical figures, and uncovers the hidden secrets of human history. In this second book of the trilogy, Master Okawa discusses the concept of time and predicts the future of mankind. Followed by The Laws of the Sun and The Golden Laws, The Nine Dimensions: Unveiling the Laws of Eternity explains the laws of space. This third book of the trilogy clearly illustrates the multi-dimensional structure and the true nature of the spirit world. Communicating with the spirit world and exploring and revealing its mysteries have been Master Okawa’s continued effort since he attained Great Enlightenment in 1981. He has published spiritual messages as a proof that the spirit world does exist. “Spiritual messages” (Reigen in Japanese) are the words of the spirits revealed through the Master Okawa vocal chords. Unlike the normal channelers, Master Okawa is able to summon any spirit at will and stay conscious during the entire procedure. Since 2009, Master Okawa began conducting these spiritual messages in public, and he has already called upon the number of spirits. He has been recording and publishing messages not only from the spirits of the other world but also from the guardian spirits of those who are still living. Jesus Christ, Moses, Jan Hus, St. Joan of Arc, Mother Teresa, Florence Nightingale, Martin Luther King Jr., Saladin, Shakyamuni Buddha, Zeus, Manu, Zoroaster, Edgar Cayce, Confucius, Lao Tzu, Jean Jacques Rousseau, Immanuel Kant, Rudolf Steiner, Karl Marx, Tolstoy, H.G. Wells, P.F. Drucker, Adam Smith, John Maynard Keynes, Friedrich Hayek, Carl Gustav Jung, Thomas Edison, Albert Einstein, Galileo Galilei, Barack Obama, Franklin D. Roosevelt, Vladimir Putin, Sir Winston Churchill, Xi Jinping, Sun Yat-sen, Kim Jonh Un and more. The Dharma of the Right Mind is the main sutra (prayer) of Happy Science. This sutra contains the core teachings of Happy Science, and many of the books written by Master Ryuho Okawa are extensive explanations of this sutra. The Dharma of the Right Mind was inspired by Shakyamuni Buddha’s consciousness and therefore has the power to purify our minds with the light of Buddha. This prayer has 10,000 times more power than the Lotus Sutra or the Heart Sutra of Buddhism. The prayer book on left is for the devotee and right is for the member. Master Ryuho Okawa granted this sutra in 2010 exclusively to the devotees of the Three Treasures. This holy sutra, “Prayer to El Cantare,” pronounces the greatness and the existence of El Cantare, the God of the Earth, in whom we believe. This is a precious sutra that reminds us of our mission. This sutra also contains “the Principles of Happiness,” namely “the Fourfold Path” (Love, Wisdom, Self-Reflection and Progress). 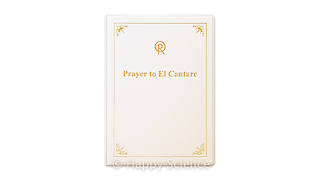 Since Master Okawa granted us with the Prayer to El Cantare, Happy Science has advanced in faith to a higher level, toward our belief in the God of the Earth.